· Maggie Walker Community Land Trust – Land Bank Ms. Nikki D’Adamo-Damery, Community Coordinator, Maggie Walker Land Trust, Inc.
Thursday, February 14, 2019: 10:00 a.m.-2:00 p.m.
Sam Patterson, Liaison for The Honorable Cynthia I. Newbille, Councilwoman, Richmond City Council, Richmond East End 7th Voter District, at 804.646.3012 (tel), orsam.patterson@richmondgov.com (email). 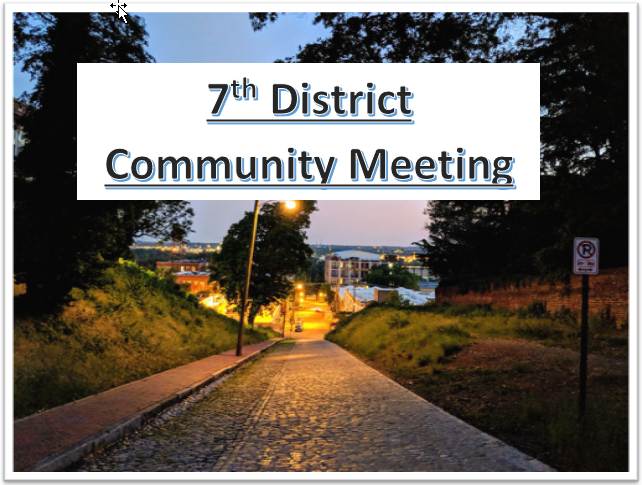 Councilwoman Newbille personally holds individual meetings throughout the year that include her goals and accomplishments; topical agendas; and, special guests. She invites all Richmond East End 7th Voter District residents to attend. Free refreshments are typically served.